The Downward Facing Dog Pose (Adho Mukha Śvānāsana) is popularly known as the pose which resembles a dog bent forward. In Sanskrit, the words mean ‘down’ (adhas), ‘face’ (mukha), ‘dog’ and ‘posture’ (āsana). As you start attaining perfection through practice, the pose offers many health benefits. The best thing is that a beginner can always perform the pose with ease. 2 How to do the Downward Dog Pose? 2.1.1 Was this article helpful? The Adho Mukha Svanasana is always considered to be the best poses practiced in yoga. So, let’s look at the health benefits once the individual starts practicing the asana regularly. A variation of the downward facing dog pose is nothing but a boat pose. The steps as well as the movements always strengthen the muscles around the abdomen. Eventually, the Navasana helps in supporting the spine and stretching the muscles to a certain extent. As you get into the pose, you actually lift your hips and drop your head downwards. Since the series of steps are just against the gravitational force, fresh blood starts flowing and the circulation is enhanced considerably. As you compress the abdominal muscles, the asana has a positive impact on the organs. Soon after the liver, spleen and the pancreas start functioning efficiently, the digestion process is thereby improved. As you use your hands and feet to sustain the body weight, the downward dog yoga pose helps to tone the limbs and prepare yourself for maintaining the balance. While the pose helps to alleviate stress and calm down the mind, you would he happy in reducing anxiety. Moreover, the stress is also released when the spine and the neck is stretched to a certain extent. 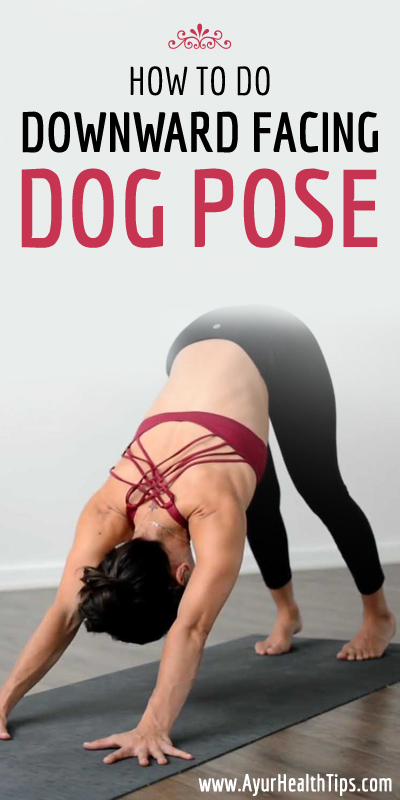 How to do the Downward Dog Pose? Before commencing with the asana, you should ensure that you have kept your stomach empty. It’s always a good idea to perform the asana a few hours later after having your meal. But, early morning is supposed to be the best time to get into the pose. #Step 1 – Initially, you need to stand on your limbs to form a table-like structure. #Step 2 – Later, you need to exhale air and lift your hips and make your elbows and knees straight. At this instance, you should ensure that the body forms an inverted V.
#Step 3 – Now, you need to bring your hands and align it with the shoulders. Make sure you follow the same step for your feet. At this point in time, you should point your toes outwards. #Step 4 – As you gain support with your hands, try touching the ears to your inner arms. Focus your eyesight to your navel as you try gaining stability. #Step 5 – After a few seconds, you need to bend your knees and return to the same position once again. NOTE: Before doing the asana, you should always consult a yoga expert or trainer. It’s better not to follow the steps in case you’re suffering from high blood pressure, Carpal Tunnel Syndrome, Diarrhea, a dislocated shoulder or a problem associated with your eyes. Even before you move on with the steps, you need to follow some preparatory as well as follow-up poses. While the preparatory poses are nothing but Phalakasana and Uttanasana, the follow-up poses include Sirsasana and Uttanasana. If you are new to the downward facing dog yoga pose, then here are some tips you should follow. Always check the alignment in case the body is not stable. You should then start off once again, and make sure that the knees are beneath the hips. Besides, ensure the alignment of the creases on your elbows and wrists as you follow the steps. Try practicing the asana by standing three feet away from the wall. Later, you should place the hands, and take them till they are in line with the torso. Make sure that your arms are always parallel to the floor. Check for ventilated room in case you are planning to do the asana regularly. In case there’s no other option, then you can practice the pose in your backyard or at a nearby garden. Finally, for making the asana intense, you should try some variations once you are comfortable with the pose. Firstly, you can always lift your body higher as you tend to pull your hips. In case you wish to enhance strength in your arms, then use a belt for enhancing the intensity. Way beyond, you can place the belt just above your knees and work upon increasing strength in your legs. But, while you are proceeding with the step, it’s better to draw your thighs outwards.